Listen to this track with Torontonian renaissance man and pop singer-songwriter Andrew Cash. It’s “Trail of Tears” as taken from his 1988 debut record Time And Place. Hooking into a sort of rootsy pop feel much like Blue Rodeo, and especially like Toronto scenesters The Skydiggers, which his brother helped to form, Cash traded on jangly pop guitar hooks and socially aware lyrics too. The whole concoction fit perfectly on the charts here in Canada at a time when the local scene was beginning to enjoy nation-wide attention. 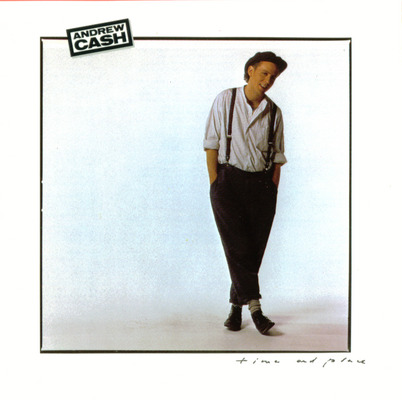 This was the lead single on his debut, typical of Cash’s approach of pop smarts and political content. But, it’s also a superlative example of a late ’80s return in Canada to singer-songwriters who had something to say in a global landscape where the protest song was something of a throwback to another era. With this one, a resident in the First World is confronted by how life around him often comes at the expense of those far away, or even those not so far away but otherwise unknown to him. Despite how the ’80s as a decade is known for dated textures, thematically speaking this song still lives and breathes today, of course. It also hearkens back to the past as well. Humanity has had a long and shameful history of dehumanizing practices, where the acquisition of territory and cultural dominance are concerned in particular . The “trail of tears” mentioned here in this song cannot help but reference the Indian Removal Act under Andrew Jackson’s presidency in the 1830s, an appalling human rights violation on a grand scale and made into government policy where huge populations of people were effectively removed from their homes by virtue of their race. Andrew Cash followed this record up with two others, while also gaining the attention of the Canadian music industry as “the most promising male vocalist” before the end of the decade. He’d go on to form other bands, most notably with his brother as the Cash Brothers by the late ’90s and early 2000s. But, Cash’s most recent work has less to do with chart action, and more to do with local politics as an NDP (New Democratic Party) MP in the Davenport riding in Toronto. He took office in 2011. In edition to his other policies that support working families in his riding, one issue close to his heart was saving the Sam The Record Man sign, which was an established landmark on Toronto’s Yonge Street before the chain closed down. Even as a politician, he’s still a music guy at heart. Check out Andrew Cash’s website to learn about what he’s up to, politically speaking.